We’re always thankful, and this time a year we’re thankful for VIP insider screenings of films that have such an intense Oscar buzz. 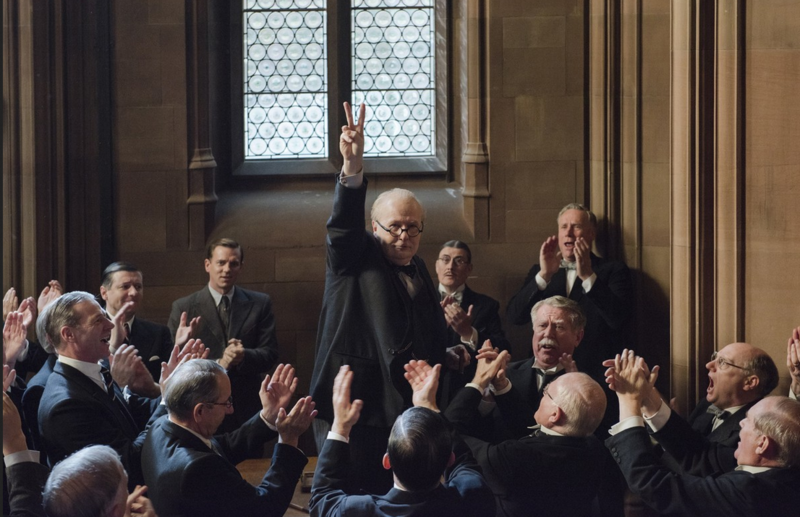 Like with the new film, The Darkest Hour, which is attracting so much attention as award season kicks into high gear. Plus, we love learning while we are being entertained. The film is set during the early days of World War II, and with the fall of France imminent, Britain faces its darkest hour as the threat of invasion looms. As the seemingly unstoppable Nazi forces advance, and with the Allied army cornered on the beaches of Dunkirk, the fate of Western Europe hangs on the leadership of the newly-appointed British Prime Minister Winston Churchill (Academy Award-nominee Gary Oldman). While maneuvering around his political rivals, he must confront the ultimate choice: negotiate with Hitler and save the British people at a terrible cost or rally the nation and fight on against incredible odds. Kristen Scott Thomas as Mrs. Churchill is as marvelous as Oldman is. Lithe ingénue Lily James (you know her as Rose on Downton Abbey) shines as the young woman thrust into world history as Churchill’s determined assistant. The war, in this movie, affected the world and continues to.